Developer Vector Unit just released the third entry in the Riptide GP, jet ski racing series, as a full premium title with no iaps, for all android devices. Riptide GP Renegade (free download apk below) lets you race around in super-powered jetskis, do awesome tricks when you hit a big wave or a ramp, get boost, and much more. It offers a career mode, quick races and challenges, online multiplayer, and (on the SHIELD at least) four-player splitscreen co-op. - Thrill-Ride Environments: floating factories, military bases, etc. 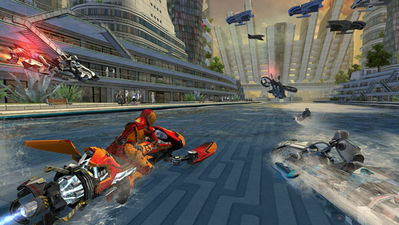 - Deep Career Mode: Earn cash and experience to upgrade and customize your hydro jet, unlock new stunts..